If Monty Python decided to resdesign Slavic phonology, they might take some inspiration from Polish. What do the following names have in common ? They all contain the Polish letter Ł, which is pronounced like the letter W in English or the first consonant in the French word oui or /w/ in the International Phonetic Alphabet (IPA). In other words, these names are pronounced : VaWensa, MikoWai, Wódź and VoitiWa. The famous river across which the Soviet army in 1944 sat watching as the Polish resistance in Warsaw was being exterminated by the Germans is /Viswa/. Poles say /wachina/ for Latin and /Wachinska…/ for Latin America, and Slavs are /sWovianin/. Such eminently old Swavic names become /Ludmiwa/ and /Vwadiswav/!!! Can it just be a coincidence that Poland is still Polska but its neighbours are Wotva, Buwgaria, Swovacia, Biaworus, Mowdavia and Jugoswavia ? Brazilian readers (and I know you exist) who are from the southern states must appreciate the horror inflicted by the rest of the country who pronounce /L/ at the end of syllables as /W/. Thus Brasil and Portugal are pronounced something very close to /brasiw/ and /pokhtugaw/. In English a related phenomenon occurs in some varieties of Cockney and Estuary, where the word feel comes close to sounding like /feew/. The transformation of Ł into /w/ from an actual /L/ took place quite recently. One thing Poles will tell you is, they associate the older sound with an archaic, stilted, snobbish form of speech, which can still be heard in old Polish films — rather as many Anglophones find movie speech from the 1930s and 1940s pompous and strikingly different from popular forms heard today. The /w/ pronunciation is supposedly some peasant speech that displaced the educated pronunciation after the war. Which makes me wonder, what happened when all these territories were annexed by the Soviet Union in 1945 and their Polish inhabitants “moved” to the eastern territories of Germany annexed by Poland ? Non-Poles don’t appreciate enough how massive a change this “move” was. How many other whole countries have been “moved” so much in a flash, at least in recent memory ? 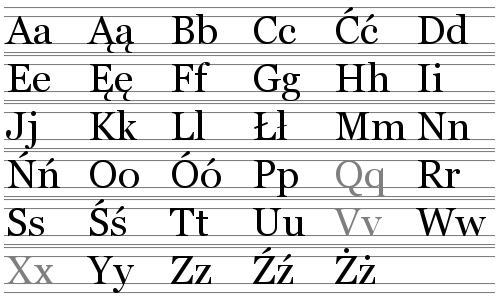 By the way, the Poles have an unusual and striking bias against liquid consonants in general. In many instances they also transform what would be pronounced as /r/ in other languages into /zh/ (as in the French J or Z in English azure) which in Polish is written as RZ. For example, the Polish variant of the common name Andrew/André is Andrzej and pronounced /andzhey/ ! The common name Christopher in Polish is Krzysztof but is pronounced /kshishtof/ !! The city of Rome is written Rzym and pronounced /zhim/!¿! @#& !!! That is just too bizarre. Final note : Italy is called Włochy in Polish and pronounced /vwokhi/. When I first learnt this I was bewildered. Why on earth would Italy be Włochy ??? Then I realised it sounds rather like Vlachos. I have a Greek acquaintance (he makes and exports kasseri cheese) who actually belongs to an ethnic minority in Greece known as the Vlachs, or Wallachians. Wallachia was one of the principalities that eventually united to become Romania. And the language of Greek Vlachs is a Romance dialect closely related to Romanian. Of course Romanian is the remnant island of Latin amidst the Swavic sea. The word Vlach ultimately descends from the Germanic word Walhaz, which is the etymon also for Welsh and Wales. Believe it or not, the words Gaul, Wales, Walloon (as in Belgium), Galicia (the name of a region in both Ukraine and Spain), Galatia (as in Paul’s epistle to the inhabitants of a city in modern-day Turkey) and the last syllable in Cornwall, are directly or indirectly related to that Germanic word. In other words, Polish must be the only language that still refers to Italy as Gallia Cisalpina ! Note to the puzzled : “Liquidity preference” in economese is the public’s desire to hold cash. This entry was posted in Languages and tagged dark L, L-vocalisation, language, Polish. Bookmark the permalink. (1) The actual pronunciation of the city of Łódź is /wuʨ/. (2) Polish is not the only language where a reflex of Germanic *walxaz still officially refers to Italy and Italians. Hungarian is another (the word there is Olasz, a Slavic loan). You might also have mentioned Wales and Welsh (as well as walnut = nux gallica), from the same source. Germanic speakers first applied the name *walxaz to Celts (in general, though the original reference was to one particular ethnic group, the Volcae), and then to any “southern foreigners”, whether Celtic or Italic/Romance. The Slavs borrowed it in the latter sense (any Romance speakers). As a result, people so called are scattered all over the map of Europe, from Wales to Romania. Oops, you did mention Wales and Welsh. Sorry. A nice post! Very interesting post, I learned a lot from it. As my predecessor pointed out, we don’t pronounce “ó” as “o”, but rather as “oo”, so Łódź is rather “Woodch”. Also there is no such a name as “Andzrej”, there is only “Andrzej”. And yes, massive migrations from Kresy to Western Poland made it socially less cohesive, with lower social trust and higher crime, despite its higher income than that of Eastern Poland. Thanks! But Andzrej was obviously just a typo (corrected). As for Łódź, I did not want to distract from the pronunciation of the initial consonant. But I have replaced the original with Wódź. i am unable to prevent myself from pointing out that wałęsa is spelled with an ę (polish nasal vowels being their own interesting thing — i’ve heard it said more than once that “polish has one of the few examples of phonemically distinct true nasal vowels” but i believe they have all but disappeared in unselfconscious speech, being decomposed into various combinations of non-nasal vowels and nasal consonants. they’re just too annoying to pronounce).